Going on a family vacation may mean bringing along your furry family member as well. Who wants to leave behind that cute face?! Traveling with dogs can be a bit tricky but with the right planning and the right equipment it can be easier than you think! 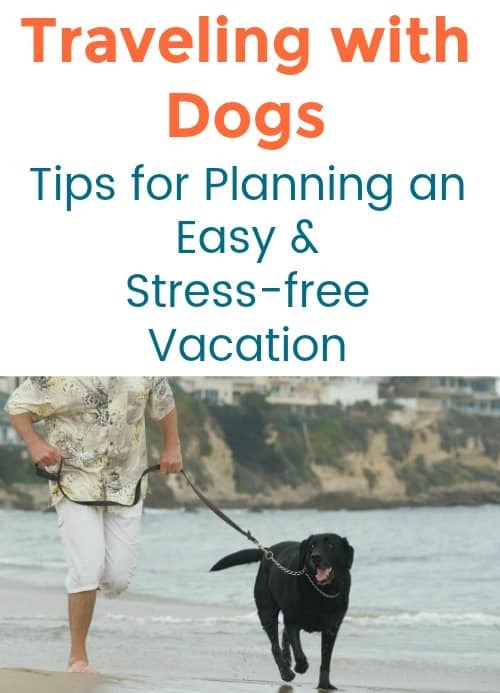 You may be thinking, “Can I travel with a dog?” Taking your dog on vacation may be the right choice for your family, especially if you will be gone for a long time. It is easiest and less stressful for dogs to travel by car so keep that in mind when planning your trip. 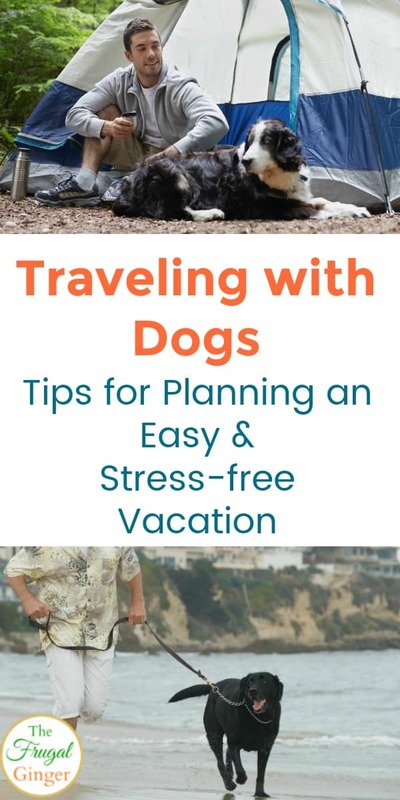 I wanted to share some of my favorite traveling with dog tips so that everyone can have a much more relaxing vacation. You know your dog and their temperament best so use the tips that will work the best for you and your fur baby. Road Trip: Road trips are a lot easier for dogs to handle over flying in an airplane. You can take frequent breaks to let them stretch their legs and they are in close proximity to you, so they are more comforted even if they are a bit stressed. When planning your road trip, make sure you have mapped out stops every 1-2 hours so that they can get out to stretch, have water, and relieve themselves. You have two options to help keep them restrained in the car: a seat harness or a crate. You really should use one of these to keep your dog safe and to keep you from getting distracted while driving. If your dog tends to shed, you may want to get a seat cover to put down to keep the mess to a minimum. Also, have a collapsible food and water bowl in the car for when you take breaks. If your dog isn’t used to going on long car rides, start getting them acclimated little by little a few weeks before you plan to hit the road. You can put them in the car and drive around for 20 mins, then 30 mins, etc. to see how they will react. Hotel Stays: When planning your trip, it may be best to stay in a vacation rental instead of a hotel, especially if your dog tends to bark. If you do stay in a hotel, try to get one that is a motel style, with doors on the outside. This will make taking your dog outside to do his business so much easier. It can be a nightmare getting your dog in and out of an elevator. Before you book the room, ask about fees associated with bringing your dog. Just because it is “pet-friendly” doesn’t mean that it is free. If you will be leaving your dog in the room by themselves, let the front desk know and give them a number to reach you in case your dog starts barking. Also, make sure to put the Do Not Disturb sign on your door so housekeeping won’t come in. You may also want to leave the TV on so that it will help drown out some of the noise coming from the hallways to help keep your dog calm. Beach or Lake Vacation: If you are going to travel with dogs to the beach or the lake, use these tips to help keep them safe. If your dog is going to be playing in the ocean or riding on a boat, invest in a good dog life jacket. Look for one that has a sturdy handle so that you can easily pull them out of the water if they get tired or are in trouble. Make sure to bring plenty of clean water and their collapsible bowls so they won’t drink from the ocean or the lake. The water can be full of algae and bacteria that can make them sick. Bring the sunscreen! Dogs can get sun burnt, especially if they have light colored or short fur. Apply a pet safe sunscreen to their bellies, ears, and any other hairless area. When you are ready to leave, rinse your dog off with clean water if they have been swimming. Chlorine can cause gastric problems if ingested and salt water can irritate your dog’s skin. When you are traveling with dogs, you want to make it as safe and fun for them as possible. They didn’t come along to just sit in the hotel room, right? If you are traveling with dogs, it is important to do a bit of research and planning before you hit the road. You can checkout Bringfido.com to search for pet-friendly lodging, restaurants, campgrounds, and attractions for your destination. You can find some great dog parks in the area by searching on Dogpark.com. It’s important to know where the closest vet is in case of an emergency. For each destination you will be going to, search Vetlocator.com to find pet emergency services for that area. Once you find the vet, save the number and address to keep with you just in case you are in an area with no Wi-Fi. 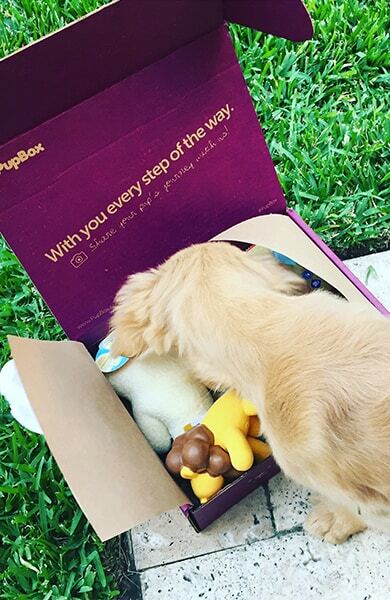 If you want to have some new treats and toys on hand to keep them busy on the road trip or hotel stay sent straight to your house, check out PupBox. Every month, your little fur ball will get treats, toys, accessories, and training tips for you. They send you supplies based on your dog’s age so this is a great surprise for dogs of any age. You can even use code PUP50 to get 50% off your first box. Traveling with dogs can be so much fun! Use these tips to make it as easy as possible on both you and your pet. They are a part of your family and deserve a relaxing vacation, too!